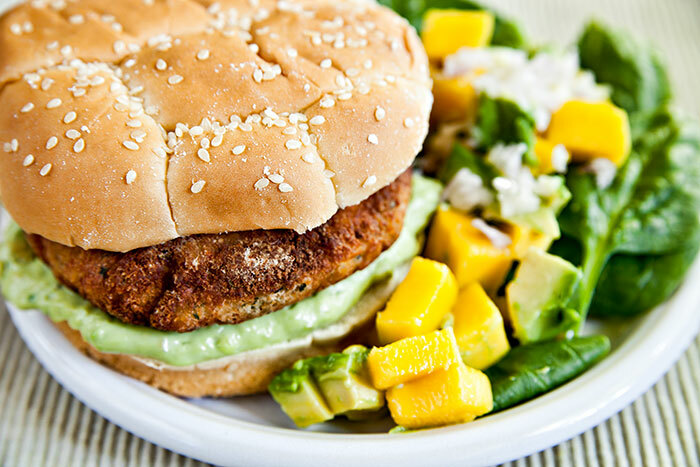 Dinner tonight consisted of a shrimp burger (yes…shrimp) with a tasty avocado and mayo dressing. Complimenting the shrimp burger was a spinach, avocado and mango salad with a touch of diced red onions. This photo was taken entirely with natural light from a nearby window. I did use a silver reflector positioned to camera left to provide a bit more natural light as it was evening when I took this shot and the light was quickly retreating into the horizon. Because I was dealing with lower light conditions than when I use a speedlight I used a tripod to steady the camera. The shutter speed was 0.3 seconds which would be nearly impossible to hand hold and shoot. I set the camera to Av (aperture priority) mode and let the camera choose the appropriate shutter speed. With this setting I could choose the aperture (f/6.3 in this case) and thus the amount of the image that would remain in focus and then let the camera set the shutter speed. I’ll be talking more about the different shooting modes next week when I start a new series on Learning the Basics of the dSLR. It will be lots of information on things you really want to know to take better photos but didn’t want to read in the manual. So check that out starting next week. So I am interested to know how many of you have had a shrimp burger before?